Debido a restricciones por parte del fabricante no podemos enviarle este artículo. Maidenform products to the European Union. "Good quality and size. 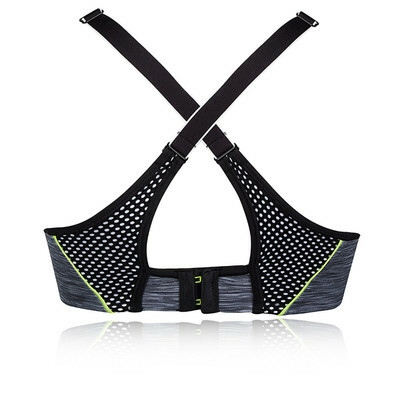 Lovely design"
Designed for medium-impact sports, the Ultimate sports bra offers bounce control and a moisture wicking fabric for a cool and dry workout. The Maidenform Ultimate Underwire Sports Bra is perfect for those medium-intensity workouts such running or zumba. Designed with a contoured underwire cup featuring light comfort foam padding, shaping support and bounce control. Made with a moisture wicking fabric lining which pulls moisture away from the body to the outer layer to keep you feeling cool and dry. For enhanced breathability, mesh panels are located at the back of the bra and the patterned, seamless stretch outer cup has a ventilated centre inset. Elasticated racerback straps alter in the front for easy adjustment, while the back is designed with a hook-and-eye closure for easy on-and-off. Contour Underwire Cup - Featuring a light comfort foam padding, shaping support and bounce control. Patterned, Seamless Stretch Outer Cup - With a ventilated centre inset for breathability. Tall Centre Front - Helps control bounce. Moisture Wicking Lining - Pulls moisture away from the body to keep you cool and dry. Elasticated Racerback Straps - Easy adjustment in the front. Mesh Panels - Located at the back for added ventilation. Coated Metal Hook-And-Eye Closure - For easy on-and-off.